Mary put a lot of love into the complete renovation of her kitchen 10 years ago — those vintage-looking cabinets are all built from scratch — but now love of another kind has her putting it on the market for sale: “That kitchen made me so happy,” she said, “but I gave it up for love. I guess a good man trumps a cool kitchen.” Congratulations, Mary! The kitchen got the glamour treatment for the listing photos, so let’s take a look — and Mary tells us about her planning process and the products she used. Thanks for permissions from realtor Paul Carper and realtor Bart Stockton, who took the photos, both of Carper Miller Real Estate Group. 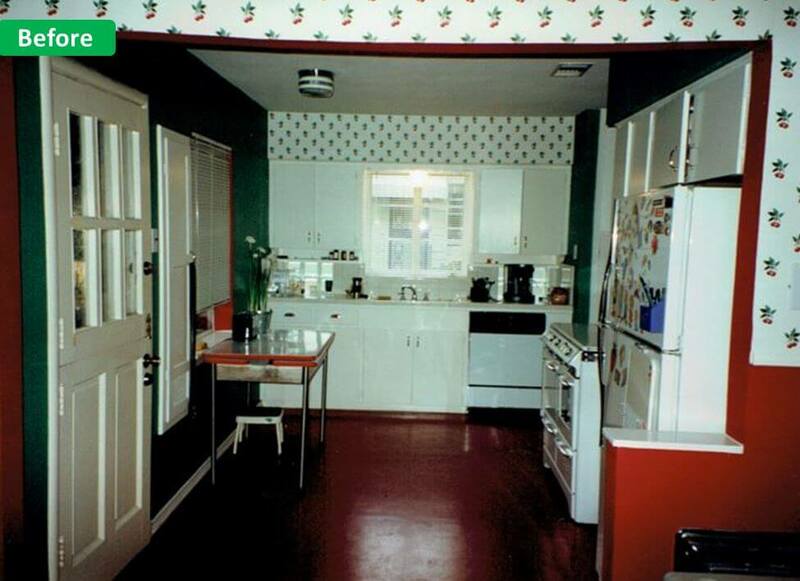 I love your site and I thought you might like to see pictures of my 1950s house. I renovated the original small 1950 kitchen about 10 years ago. I wanted to keep the 50s look, but open it up and add more storage. I had a blast researching home magazines of that era. The final product was bright and fun and I love it. The original bathroom is also in tact. It’s not pink, but it’s still the style of many houses of that time. I found some great wallpaper to watch the style of the bathroom. Cabinets were custom made. It would’ve looked weird to try and retrofit the old cabinets with new ones so they gutted the entire kitchen with custom cabinets based on the elevations. 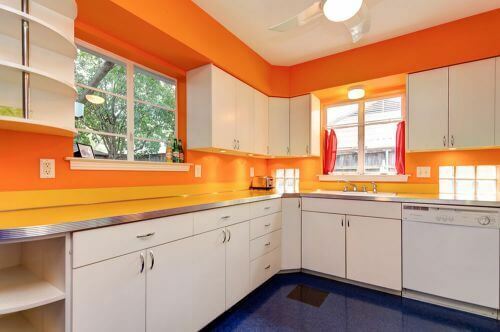 Someone commented that my custom cabinets look like something prefab from the 50s. Hardware came from Home Depot. As I mentioned before, some of the old classic hardware is still available at big hardware/home stores for not a lot of money. The stove belonged to my grandmother. I still have the receipt from when she purchased it in 1953! It has since been restored and re-chromed to look brand new. That was not cheap, but I consider it a family heirloom that deserves to be taken care of. I was lucky enough to find someone locally who does that sort of thing. If you live in the LA area, Antique Stove Heaven is a good resource. The Vent-a-hood is actually new. I didn’t want to try to find something retro for that so I just went with a simple white. For the walls, I wanted something bright colorful, which isn’t necessarily a 50s thing so I went through lots of color and design books, like this: Color Idea Book. No need to buy the book. Check it out from the library for free! Also, paint stores have lots of color combinations for ideas. Under-cabinet lighting — One of my favorite parts of the kitchen is the under cabinet lighting. They’re the simple hockey puck lights from Home Depot, but when you dim the halogen lights, the orange glow of the walls and counters is wonderful! It’s like a sunset. Dinette — In the breakfast room, the dinette set came from a local antique store and the chairs are from Target. Several years ago, they were selling dinette chairs that I think were created by the same manufacturer as dinette sets in the 50s. Pendant light is the KNAPPA from Ikea. Art — I found a book — All-American Ads of the 50s by Jim Heimann (affiliate link) — that features a bunch of 1950s advertisements and framed them in a grid. I live in Dallas. It’s in a part of town with some older homes, some of which are have the retro flare. 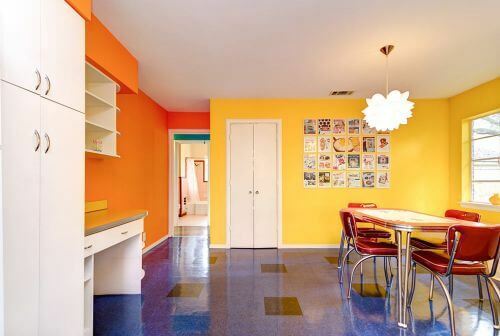 My realtor appreciates the style of the house and reassures me there are people who like this sort of thing. I just need to be patient. The market is slow right now though, so it will just take time. He agrees with me that he would rather sell it to someone who will appreciate it and not gut it completely. It was a lot of fun researching and planning. The renovation was a PITA. It took 2+ months, but worth it. That kitchen made me so happy, but I gave it up for love. I guess a good man trumps a cool kitchen. 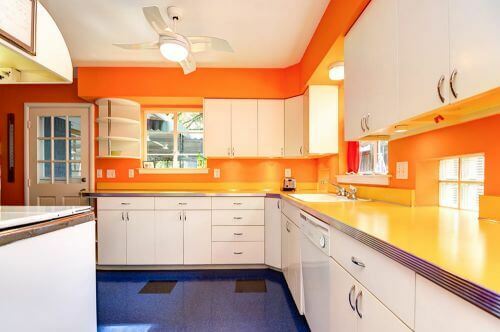 The good thing is, we bought a great midcentury modern house that has a kitchen that needs some work. I already have ideas on how to renovate it to make it look great while keeping the style of the house. Can’t wait to do the same thing — update cabinets/storage and appliances while keeping the style of the architecture. This one has the groovy (but confining) pass throughs. Only TWO MONTHS to renovation? That actually sounds fast to us 🙂 Wonderful job, Mary — and we can’t wait to see what you come up with at your new midcentury modern house! 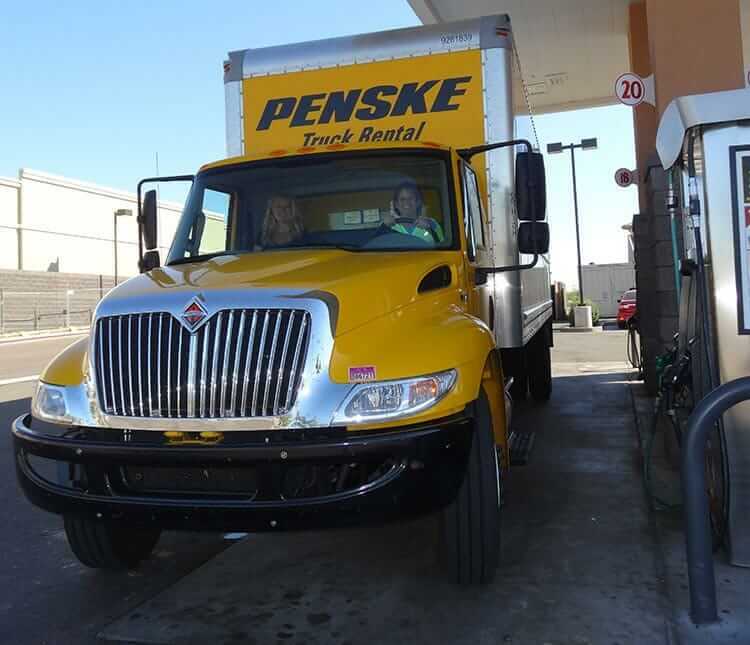 Thank you for sharing your home, and your story. 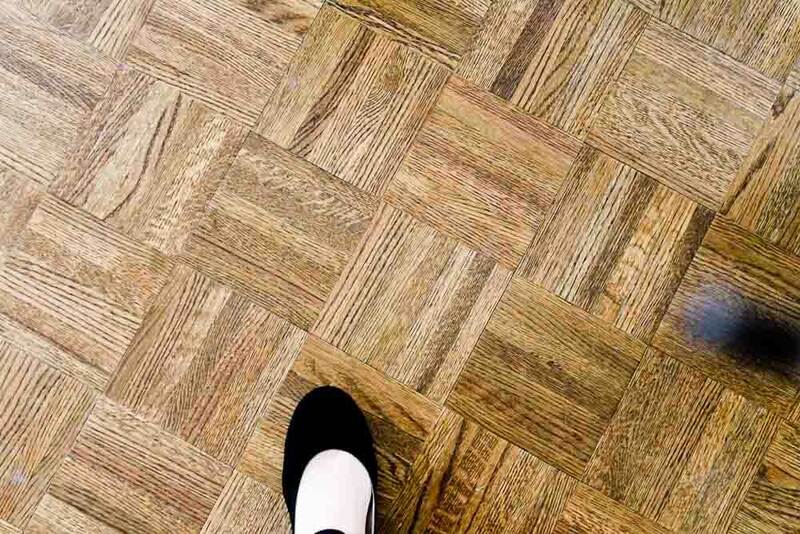 We will keep our fingers crossed that a stylin’ buyer who appreciates period style walks through your door soon! 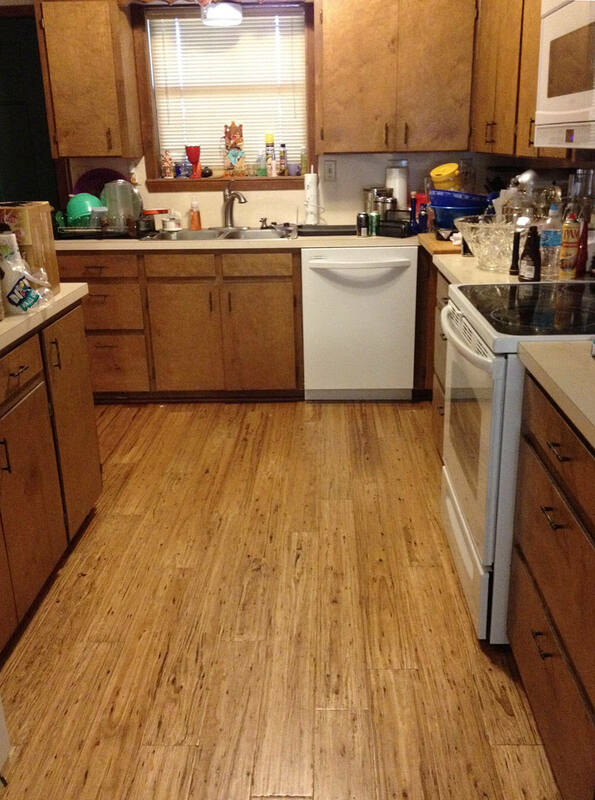 I think you did a fantastic job with your kitchen! Although the masses might not appreciate it like we do, there is a lot you could do to help sell your home without changing much in the kitchen. 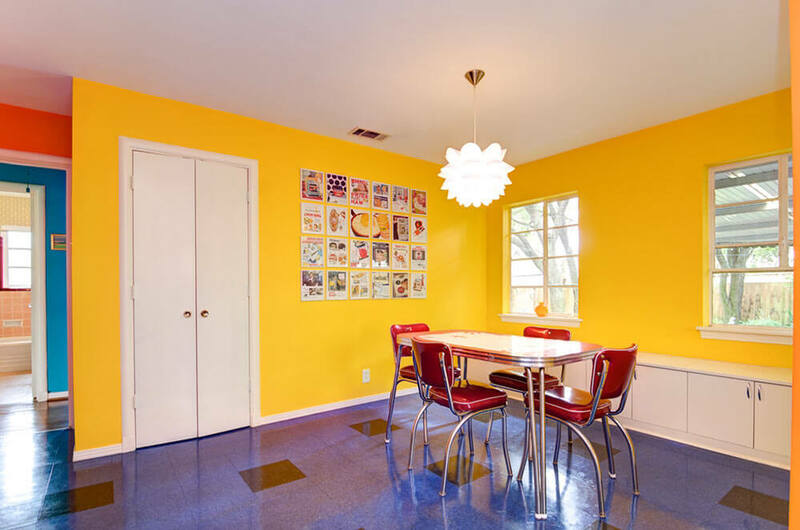 I am a designer in the bay area of Ca, and what I would suggest, is to take out any furniture from the other rooms that is not retro. 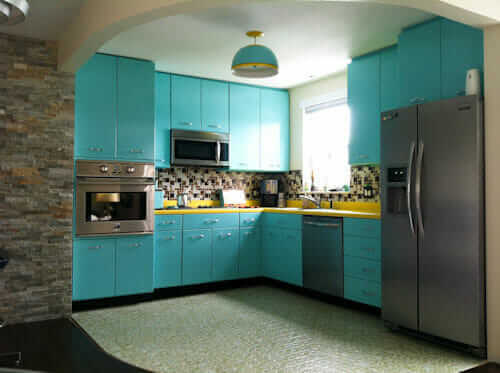 It is distracting from your beautiful home and it’s retro style. I would also suggest repainting the other rooms a neutral soft gray so that people can better envision their things in the space. The color gray would help draw in the younger, hipper crowd and goes well with your other colors. You can then re-stage those rooms using period pieces. The kitchen will then stand out as the “star”! 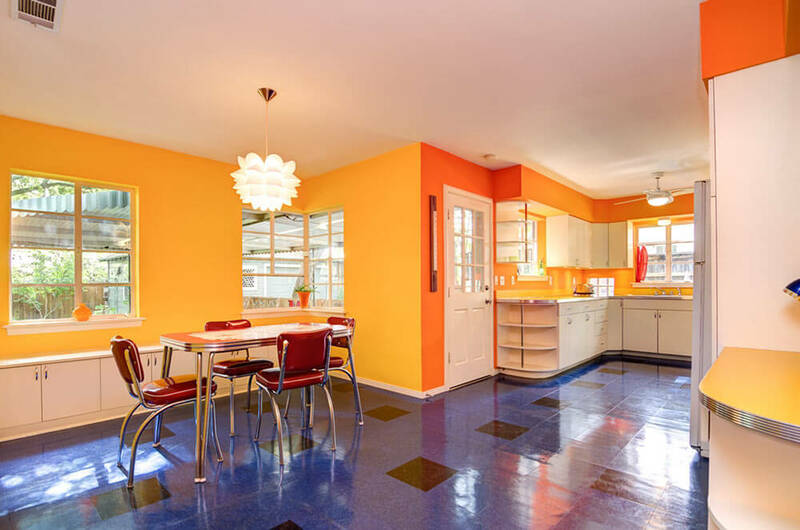 You are right about a few more staging pieces in the kitchen/dining areas….Also, your backyard is very spacious, but I would lay down new sod (cheap at H.D.) and lay down a nice outdoor rug to hide the broken concrete. Then place a nice patio set on top. I agree with your advice, Dawn. 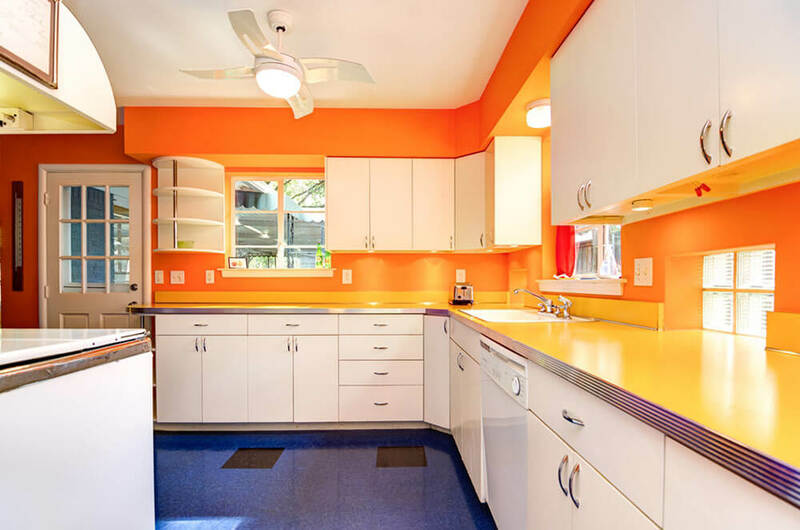 The kitchen is beautiful, but the bright colored walls all around make it difficult for buyers to imagine their own things in the home. Love this kitchen, and we’re considering updating (or “backdating”) ours as well. 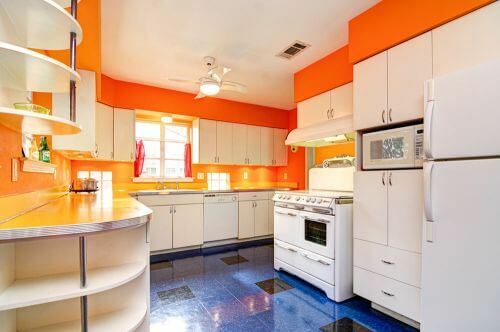 Dawn, would you know of any good, mid-century-sensitive kitchen designers here in the Bay Area? Any help would be greatly appreciated! i love it!!!! it is gorgeous! perfect. i would buy it in a new york minute!! you can come up north here and design our kitchen! What a beautiful kitchen! I’m truly impressed. I understand about people who don’t get it, I wanted a carpenter to make new doors for the bathroom vanity and a few other things in my pink original bathroom. They all want to rip it out and make it Home Depot ugly! No. Mary, you did an amazing job and it’s beautiful! I do agree with Dawn’s comment that simply changing the wall colors may allow potential buyers to see the home differently and in their own style while maintaining the vintage vibe. Paint is such an easy thing to change yet people can’t get past it in looking at a house. I wish you all the luck and so hope it goes to a buyer who will love it as much as we all do!